A Brief History of Sagrantino. The stunning colours of the Sagrantino vines in Autumn. The story goes that it was first mentioned by Pliny the Elder in Roman times when he wrote about a grape called Itriola growing in Mevania. However, as Mevania is now called Bevagna and is in the Sagrantino production zone, this is probably scholarly wishful thinking. In the 1500s it was established that Itriola is closer to the Passerina grape. There were also theories that it was brought over from the Middle East but new thinking believes it is in fact a local grape. Sagrantino doesn’t share its DNA with any other grape variety. This grape was first documented in 1549 and cultivated by Franciscan monks – which may have given Sagrantino its name from its use in giving communion. In 1662, to cut down Sagrantino vines was made a capital crime – I wonder if that law still stands? Until 1975 it was produced as a raisin wine – laying the grapes out on racks to dry out first for several weeks. Due to the massive tannins, this method made the wine a joy rather than a chore to drink. It was most likely used as the table wine for family feasts and celebrations as well as in the church. Sagrantino Passito also has a DOCG certification and also has to be 100% Sagrantino. How did Sagrantino secco start? 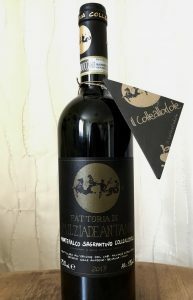 In 1975 a group of local Sagrantino wine-makers, including pioneer Arnaldo Caprai, started experimenting with different wine-making and ageing techniques with the help of the University of Milan. The aim: To produce a dry (Secco) version of Sagrantino. 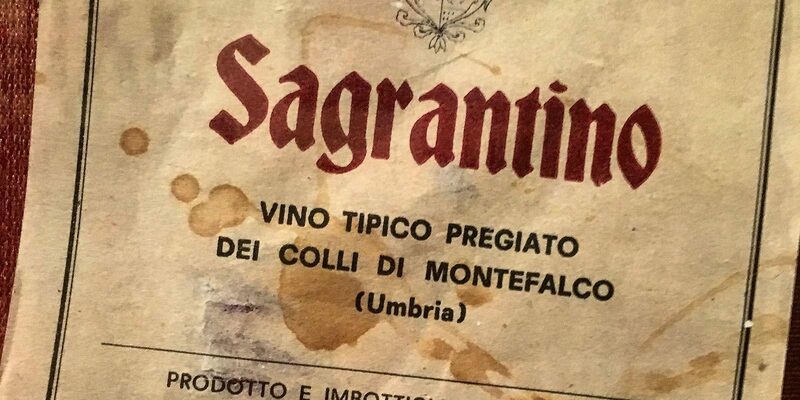 In 1979, the first vintage of Sagrantino was produced, yet as it must be aged a minimum of three years by law, it wasn’t released on the market until 1982. These days: A minimum of 37 months including at least 12 months in oak barrels & 4 months in the bottle. In 1992 it attained the prestigious DOCG rating. Both the Secco (dry) and Passito (dessert) Sagrantino have the DOCG status. There is only one other wine in Umbria to have achieved this to date – the Torgiano Rosso Riserva DOCG. 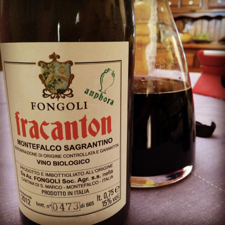 At that time (1975) there were only about 12-14 people growing this tiny, thick-skinned grape here in Umbria and they made only the dessert version – Sagrantino Passito. NB: Sagrantino is regarded as the most tannic grape in the world, with about 50% more tannins than Cabernet Sauvignon. Even now, there are only around 72 producers, who between them only produce, at most, about 1.5 million bottles a year. It took a long time for the wider world to notice these family-run wineries. But then they started attracting the attention of the wine world by winning a host of medals and awards in international competitions and expos around the year 2000. This led to a handful of Italy’s largest producers moving into the Montefalco area and starting to grow this incredible grape. Sagrantino is now exported around the world and ever more frequent articles are appearing on the internet and in prestigious wine magazines. Montefalco Sagrantino is not for the faint-hearted, it often boasts 16 degrees alcohol content. However, judicious ageing in oak and bottle tames those powerful tannins. It seems to be a rough guide (obviously with exceptions) that the older the winery, the bigger the barrels used. Quite a few of the families that have been making wine here for generations seem to favour the larger botti, whereas many of the newer enterprises tend to use barriques. Some wineries use both! Barriques – at nearly €1000 each, these are a huge outlay for any winery. Guests posing beside decades-old botti. Cantina Fongoli. The spectacular Fracanton by Angelo Fongoli. Economics must surely play a part in the decision-making process. 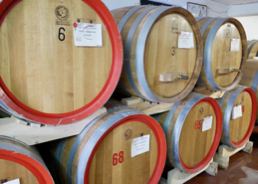 The barriques costing under a thousand euros, but the botti costing many thousands. Everything happens slower with botti, too. 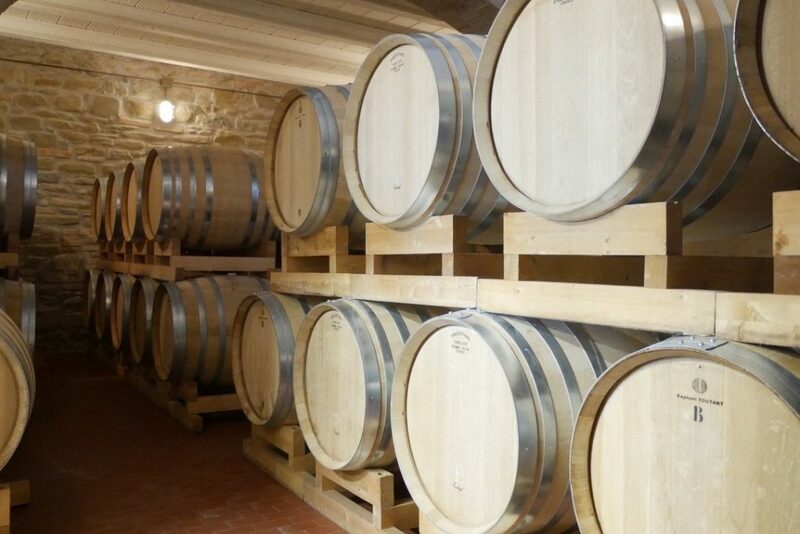 Having less surface area of wood per litre of wine, the benefits of oak ageing take more time the bigger the barrel is, so there is less chance the wine will be over-oaked. Luckily, there is no right and wrong here. We know superb wines from both schools of thought. After all, the barrel ageing of a good wine is just one of many processes the wine-maker has to think about before deciding his wine is ready to enter the public domain. And let’s not forget that with around 73 producers making this wine, there are at least 73 different ideas about oak! Then we have the winemakers who like to experiment and Angelo Fongoli of Cantina Fongoli in particular has been making award-winning Organic wines. He is transitioning to Biodynamic, a process that has its own timetable, you can’t rush these things. Angelo Fongoli has created one of the stars of the show with his Fracanton. 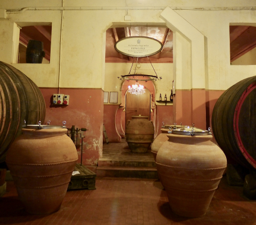 Fermented in large terracotta amphorae, then aged in the decades-old botti. As well as Angelo’s amphora-fermented Fracanton, there are several other winemakers refining their Sagrantino and creating small production ‘Cru’ wines. In our opinion, the biggest and boldest of these comes from Francesco Antano with his Colleallodole. The sublime Medeo from Devis Romanelli. The delicious Il Colleallodole from Milziade Antano. 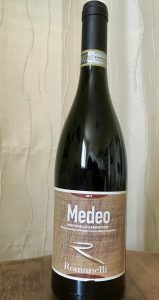 Another fabulous example comes from the young winemaker Devis Romanelli with his Medeo. Aged for a minimum of 5 years before being released on the market. The 2011 vintage shown here had a 900 bottle release. And, yes, we have a bottle! 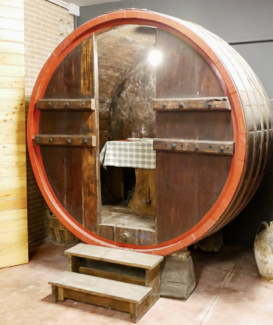 Taste your Sagrantino in a converted botte at Cantina Dionigi! and Pierpaolo Menghini of Villa Mongalli – Della Cima. Every winemaker is rightly proud of these Sagrantino wines and what we love is that every single one of them is, of course, made from 100% Sagrantino and yet all are different. After these botti have been retired – what better way to repurpose them by converting them into mini tasting rooms? Cantina Dionigi has 2 of these babies! Our guests LOVE having their wine-tasting in them, especially the honeymoon couples. Over the time we have been leading wine tours here in the Montefalco area of Umbria, we have learned that every winery develops their Sagrantino in a different way. They all have their own tweaks, quirks, ideas and methods. It was a huge revelation to us to discover that something that was made with the same grape in the same area could have such different characters. Thank you to #ItalianFWT (Italian Food, Wine And Travel) and Jeff Burrows. It’s been great to participate! 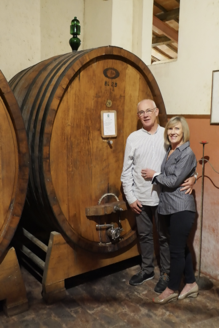 Come and visit Umbria and let us take you to these small family-run wineries. Taste this unique Umbrian wine for yourselves. Contact us at Gusto Wine Tours! Saturday, February 2nd at 11am ET / 17:00 in Italy. Join us for a chat about all things Umbria on Twitter. You can read about the group and how to participate from Jeff Burrows at foodwineclick. Join our chat using the hashtag #ItalianFWT. 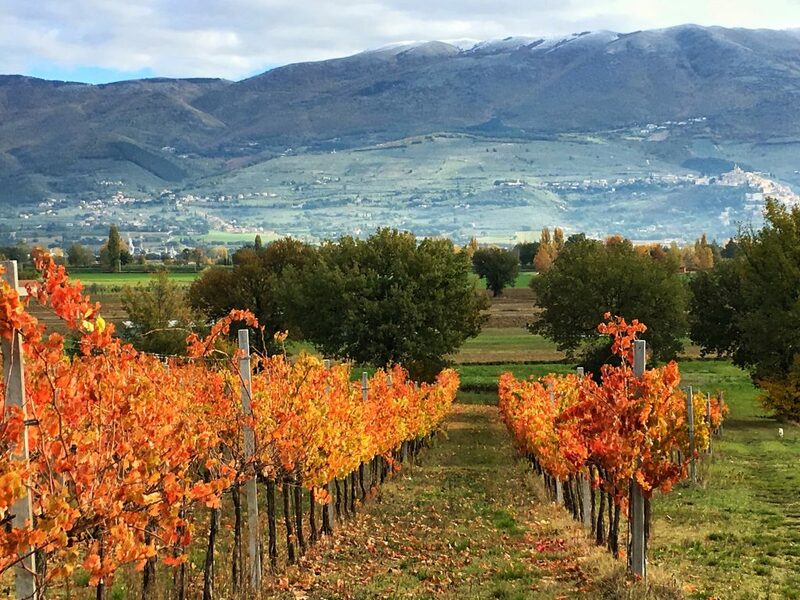 Previous Post: « Winter Warmer Tours with Gusto – Umbrian-style! Those botti tasting rooms look like fun and so, so cute. Thanks for joining the chat and adding an article to the topic. I learned a lot. Thank you Camilla, it was great fun to take part in the chat and to spread the word a little! I love the idea of a private tasting room fashioned from botti! Maybe when I finally return to Umbria I will have the chance to sip some Sagrantino in one of them. Thanks for joining the chat today and for sharing the special bottles you love. Cheers! It’s a wonderful experience, Lauren! When you come back to Umbria, let us know and we will sip Sagrantino together! After seeing those vibrant red and gold grape leaves in fall, I have another theory for how sagrantino got its name! And that looks like snow dusting the tops of the mountains! PS Thank you for joining us! Giselle, thanks for the wonderful overview of the grape. I have been wondering about the barrique vs. botte in Montefalco, as most of the first Sagrantino’s I tried were barrique aged. To hear it’s a generational thing similar to other regions was interesting. Thanks for joining us this month, I look forward to meeting in person sometime in the future! Thanks so much for the invite Jeff, it was great fun. We are looking forward to meeting you over a glass or two of Sagrantino! Great history of this interesting grape. I particularly liked the detail that it was once a capital crime to cut down the vines. I’m wondering if the law is still in place, or just ignored these days! Thanks for walking us through this tour and sharing the insight into the botti and barrique. I agree many of the old school have a lot of botti. Thank you Jen, it was a pleasure to write! Thank you Jill! Hope to see you in Umbria one of these days!